Missing School Matters is working! 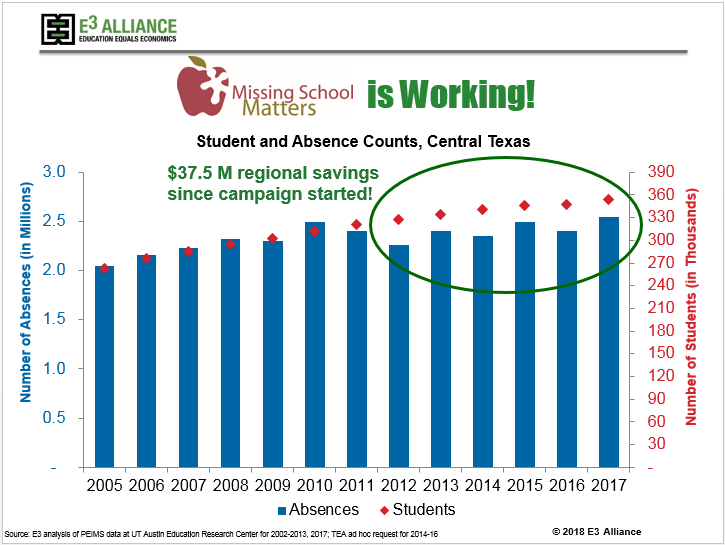 Since the regional Missing School Matters attendance campaign launched in 2012, for the first time in well over a decade the trajectory of the total number of student absences in Central Texas separated from the trajectory of overall student enrollment. This school attendance improvement means more students are in class, working to achieve academic success. Since the State of Texas sends funds to school districts based on attendance numbers, this improvement also translates to the bottom line for our community, which has resulted in $37.M in revenues being returned to Central Texas schools!